As announced at Toy Fair 2014 the final figures in Mattel’s long running 6″, Four Horsemen sculpted, DC Universe Classics line will be a series of tributes to the 30th anniversary of Kenner’s beloved DC Comics ‘Super Powers’ action figures. 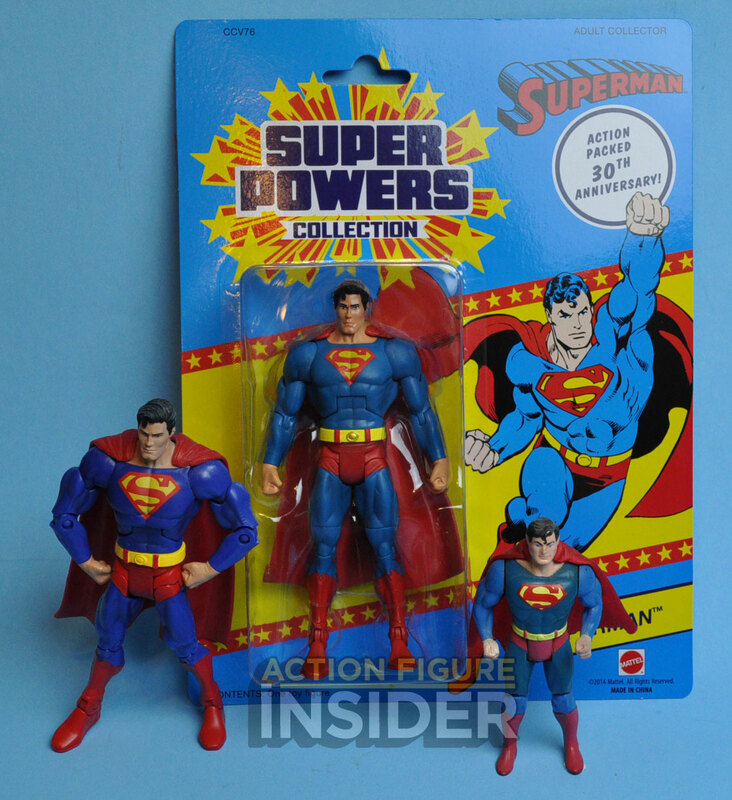 I think by now everyone that knows me knows that I am a HUGE fan of the original Super Powers line. After all we house the Super Powers Archive here on AFi as well as have a dedicated Super Powers blog. I have loved and encouraged and even helped Mattel out with some of the past DCUC Super Powers figures so I was greatly looking forward to these, and even with Mattel sending me samples I will be buying a second set to keep carded when they are released. I think it’s important to note that these are merely a Super Powers tribute/homage and not a intended to be a replica in figure or card. There are quite a few differences in details on all of the cards and figures from their original Kenner release. This figure has been a long time coming for a lot of fans. 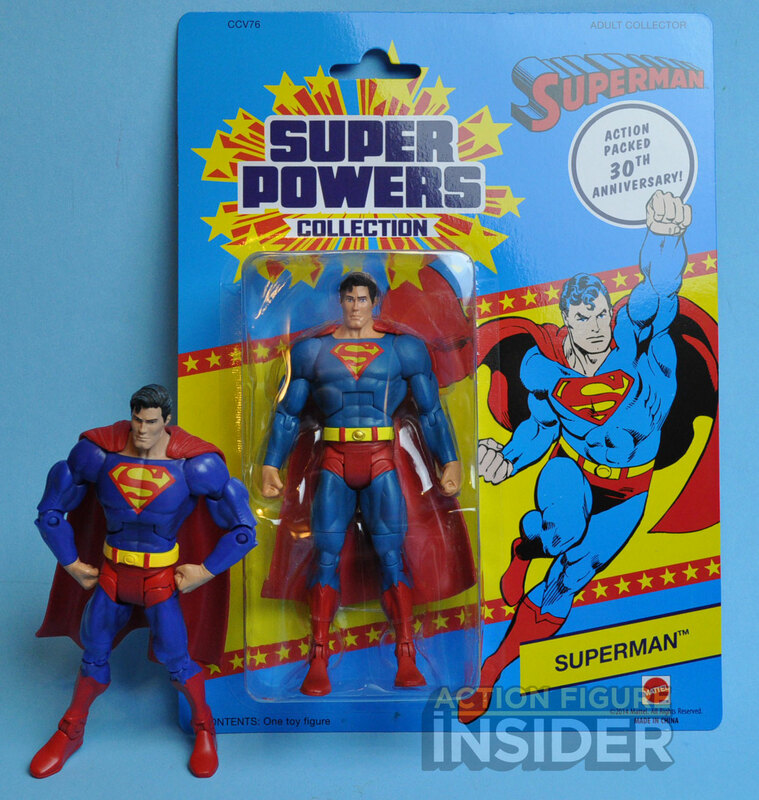 This repaint was originally designed to be part of a second wave of retailer 2-packs along with a repainted Bizarro. A hand full of samples were run overseas and escaped the factory onto Ebay. Now every that wants one finally has a shot at him! 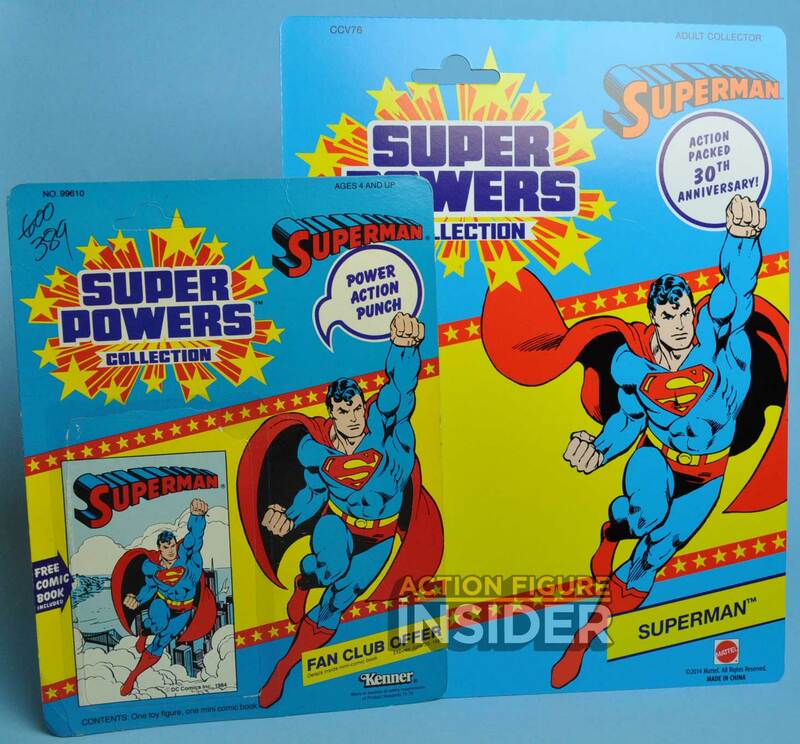 To Mattel’s credit they did use the original image out of the actual DC style guide for the card. Kenner took the same image and modified it to better fit the card. As you can see there are some differences in the card (apart from the obvious toy maker logo change) but it’s great to see these old red, blue and yellow cards again. The Collect and Connect Kalibak piece is in the mailer box. 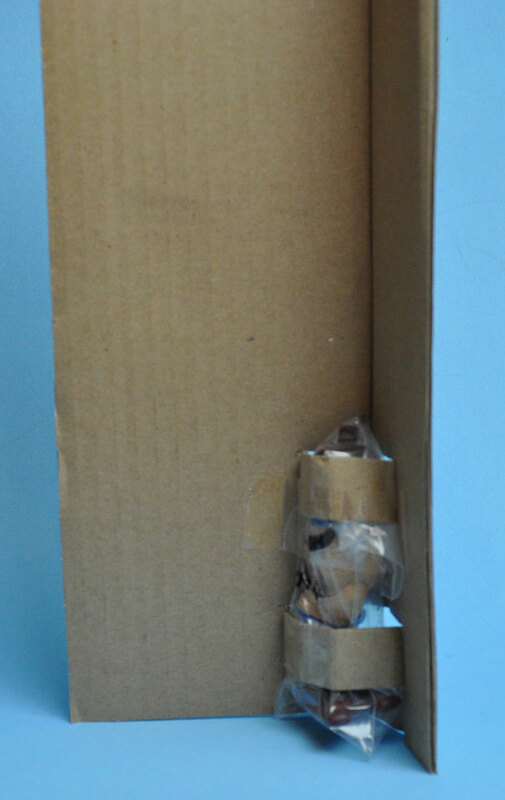 It is polly-bagged and taped to an “L” shaped piece of cardboard in the box so that it’s not in the package with the figure, as that would not be accurate to it’s vintage counterpart. Superman comes with Kalibak’s right leg. When you collect all 6 figures in this Super Powers tribute you will be able to build a brown, more Super Powers accurately colored Kalibak figure. The lighter blue paint job still doesn’t quite match the original Super Powers blue paint, but it is way closer than anything we have gotten up to this point and I think he looks great! Mattel painted the belt buckle gold, which I actually like, but is not accurate to the figure. 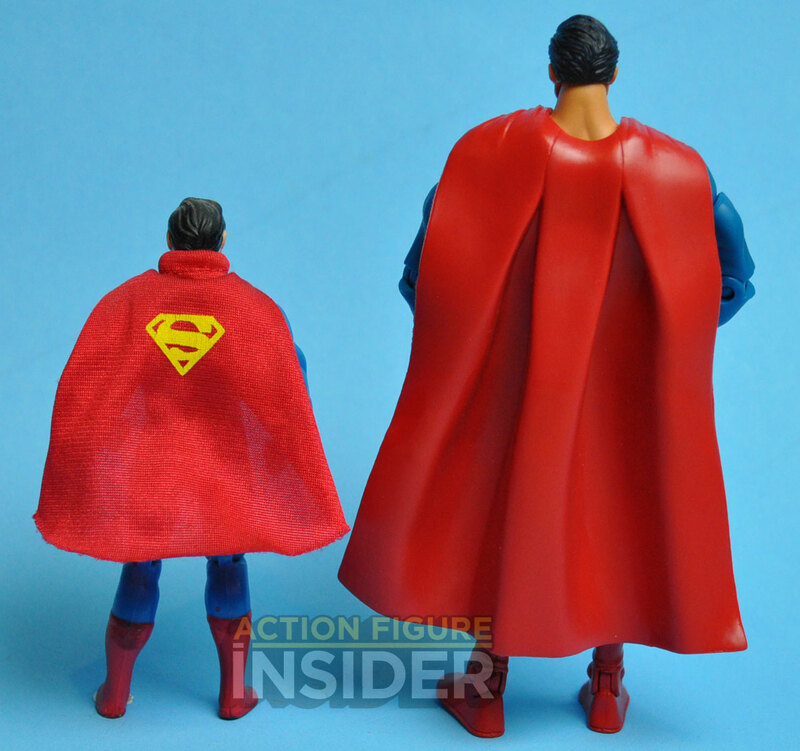 And there’s no “S” shield on the back of the cape despite it being on the original figure and on the original DCUC figure. 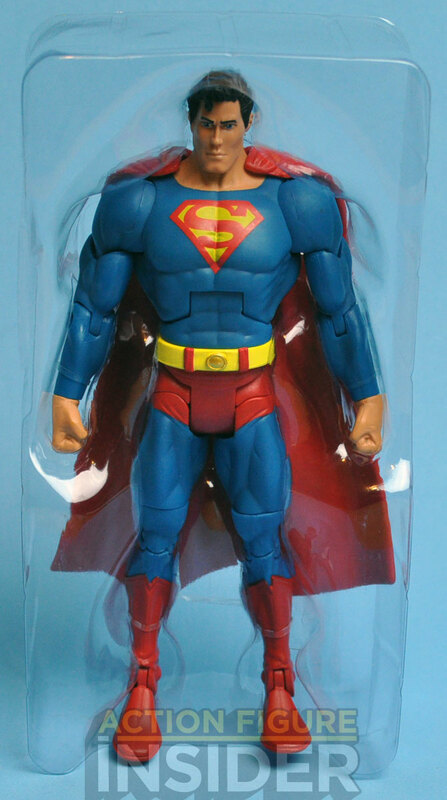 The “S” shied on the front of the figure has also been changed from the original DCUC release. The other 3 figures will be Mr. Mxyzptlk, Gold Superman, and The Riddler. The figure will be sold in waves of 3 and will be $30 a piece. These will be available to order this fall on MattyCollector.com. My only wish in closing this line with a bang was that we’d get some true homage to the original line. And thank you for your assistance in steering Mattel for once into some direction that really sang to us ’80’s kids. But why… oh why couldn’t we get a new corrected SP Clark Kent in place of Myx, Gold Superman, or even… the Riddler? which we already got 2 years ago? 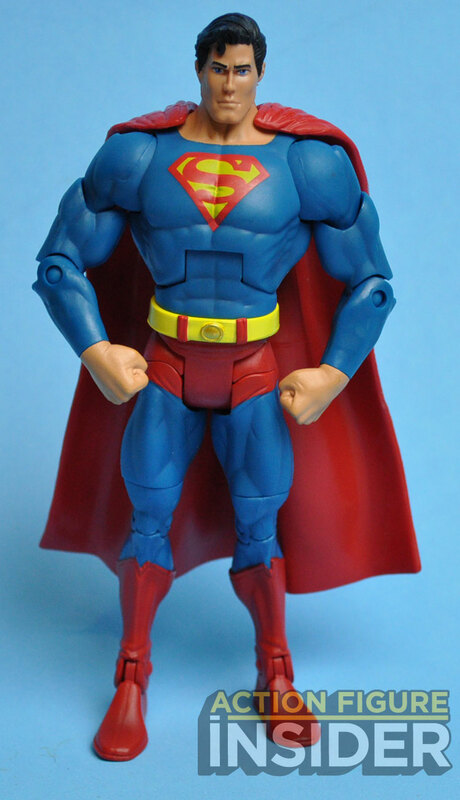 I’ve already owned my SP styled Superman for 5 years now (25th Anniversary intentionally?) though illegitimately, but even by the sample shown here, my chinese bootleg/factory contraband has much brighter production colors, correctly overlaid “S” emblem and even and “S” on the cape. But even worse… why oh why just a generic non-era related repaint of Kailbak as a BAF? I’m glad it’s come to a close though, the hunt for quality Mattel product has been a long one, and a hard one, and lately a fruitless one. Do I even have to mention 4″ Movie Masters? Oh Mattel, we’ve got a funny relationship, You’ve got just enough of what I like to keep me coming back, but you obviously don’t respect me. Let me Grudge-Buck you with this fist full of Hamiltons. Hey, they changed up his S symbol too! that’s a nice touch. 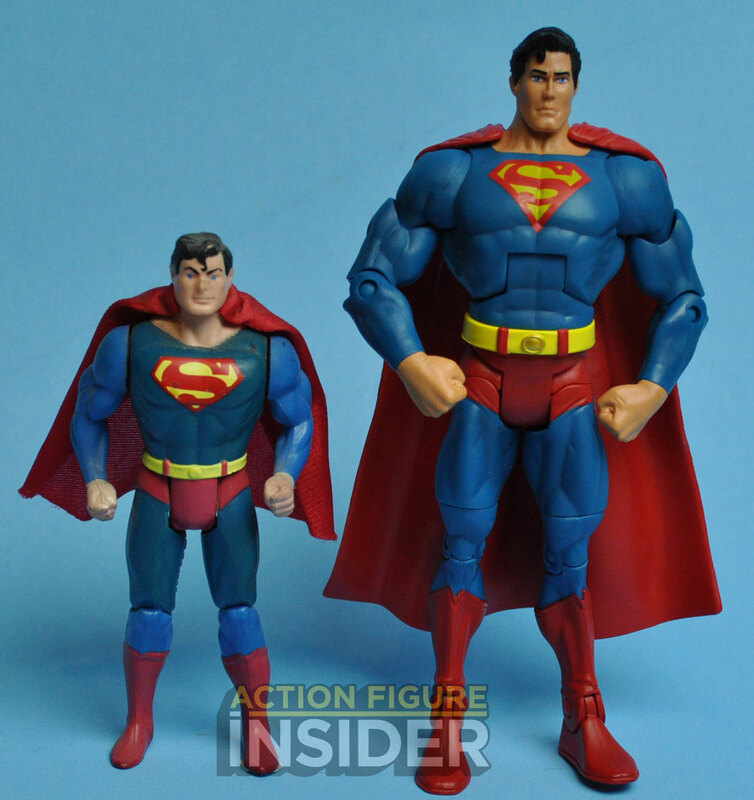 Man that supes looks a off… too big a body for too small a head.. why couldn’t they just re-release the SP ones with additional articulation? Hey Action Figure Planet!!! My blogging buddy. I figured I’d see you around here no pun intended. I’ve bought several of these bright blues over the years and only bought one that was discolored. These if they are to be as this sample dictates will have that deeper aqua blue, which is definitely a good SP tone. 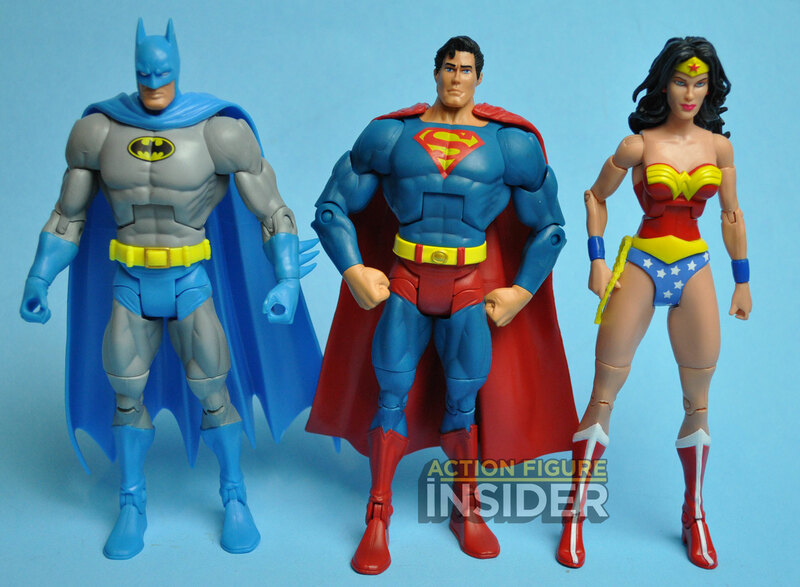 I’ve had similar issues with a few of my figures – Wonder Woman and Joker’s torsos are both discolored. I’ve never displayed any of my figures in direct sunlight. It may just be part of the natural decay of the plastic. Why paint the belt buckle gold? Why leave the yellow “S” off the cape? Why not make the “S” on the chest correct since you changed it anyway? Why not just do it right? I’ll buy but please please please Mattel, take my money and just die into kid toy oblivion already. 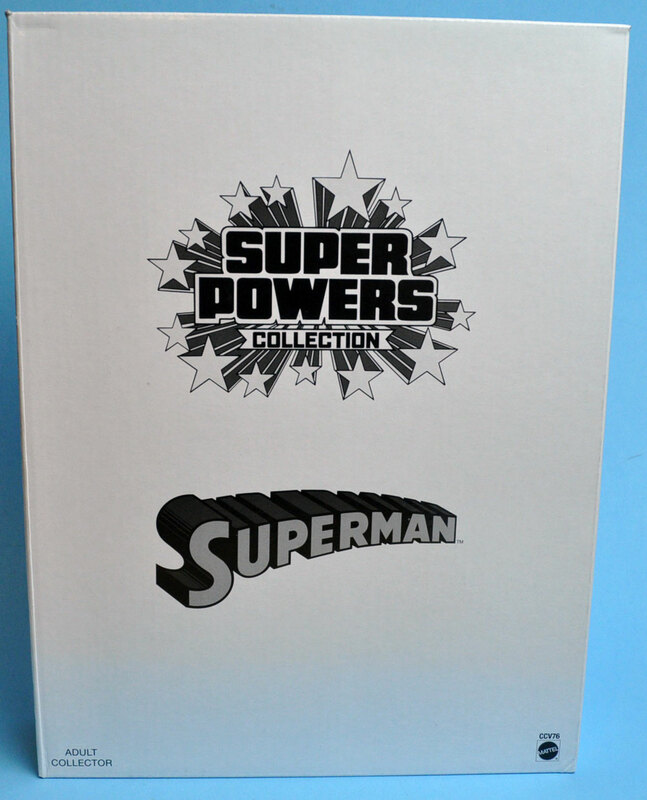 NNNNnnnnnnnnngggggg I was really wanting to not buy these but man that Superman looks great on the card. What are the dimensions of the cards, Dan? I’ve never understood the appeal of the SUPER-POWERS line. I guess it’s nostalgia? I don’t get the Super Powers attraction either. I had several as a kid and I’d have burned them for DCUC figures if given the option. By comparison they’re terrible. I’d have thrown my Mego figures into a wood chipper for DCUC and Marvel Legends when I was 8. I don’t see what makes them so special now. It’s not like a straight rerelease, even. It’s just plastic that could have gone to characters they haven’t done yet. Instead they wasted it on figures we already have. How is that “going out with a bang”, exactly? Very cool, but I still feel lack of four indispensable figures to close with golden key the DCUC line: Vixen, Granny Goodness, Dr. Sivanna and Doomsday (unleashed). By the way, where’s Obsidian in the gallery? Leave of sloth Mattel! It’s not do so much! Just 4 essential figures? While I don’t agree with all of your ideas of essential (besides Vixen, that is – it’s beyond sad she didn’t get made – and MAYBE Granny Goodness) my wish list alone could have kept this line going for another couple of years easily. My Teen Titans shelf looks pretty incomplete without an Aqualad or at least Tempest and a Jericho to complete the classic and Wolfman/Perez line ups. A Cassandra Sandsmark Wonder Girl, a Miss Martian and a Ravager would have been nice, too, They also should have made Mera, and I would have loved to have see a JSA-style Wonder Woman, Liberty Belle and Amazing Man. A figure of the female Dr. Light, and the male Dr. Light for the villain side, and … well, there are LOTS more beyond that that I wish had been made, all never to be. I’m not knocking Masters of the Universe, but for the life of me I cannot understand how there can be more fans of MotU than of DC characters to keep that line going. But weird character selections, quality and customer service issues and having to order blind almost a whole year’s worth of figures, not being entirely sure what you were gonna get stuck with, killed it for a lot of folks. But keep blaming the fans if it helps you feel better, Mattel. 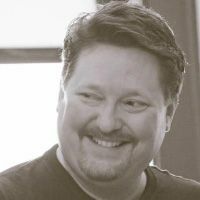 Dude, I am totally agree about much others figures that could be made, and simply Mattel don’t did – and nobody is speaking about new tools. An so special and canonical figures line like this (with bodies, paints and sculptures very worked out) don’t could go away without, at least, finish the some groups like Teen Titans, Doom Patrol, Outsiders, Freedom Fighters. 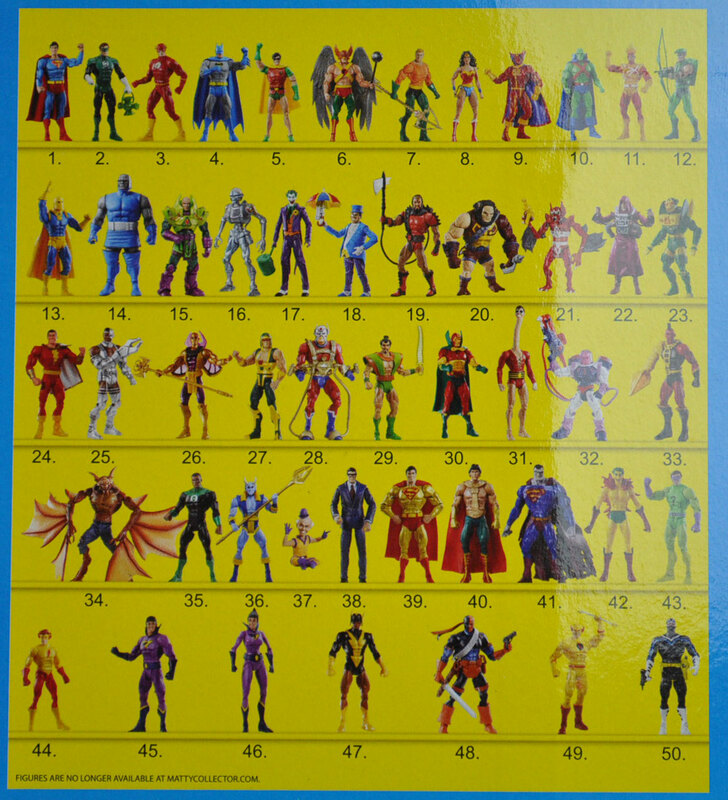 And could has made more figures from New Genese/Apokolips characters (like Grand Father, Granny Goodness, Female Furies, Forever People), Fatal Five and LOSH (Where’s Mon-el and Dawnstar? ), Young Justice, more DCAU/JLU like Shining Knight and Vigilante (Greg Saunders), much more female figures (agree to you: Vixen, Liberty Belle, Crimson Fox, Gypsy, Katanna, Killer Frost, Live Wire, and even Amanda Waller), muche more enemies (Merlyn, KGBeast, Golden Face, Dr. Polaris, Felix Faust, Dr. Sivanna, Blockbuster, Count Vertigo, and so on), much more red/yellow/blue/indigo/sapphire/white/black lanterns, and trying make iconic figures from the most important DC’s saga ever (Crisis on Infinite Earths: Pariah, Psycho Pirate, Dr. and Dra. Light, Lady Quark, Harbinger and Monitor)… Unfortunately, the blindness from the CEO’s of Mattel made they choose a complete wrong strategy, no understanding that the DC fans so eternals, nothing like a passenger bandwagon – I not saying that MOTUC is! And now, they want to compensate with this poor hommage. Seriously! 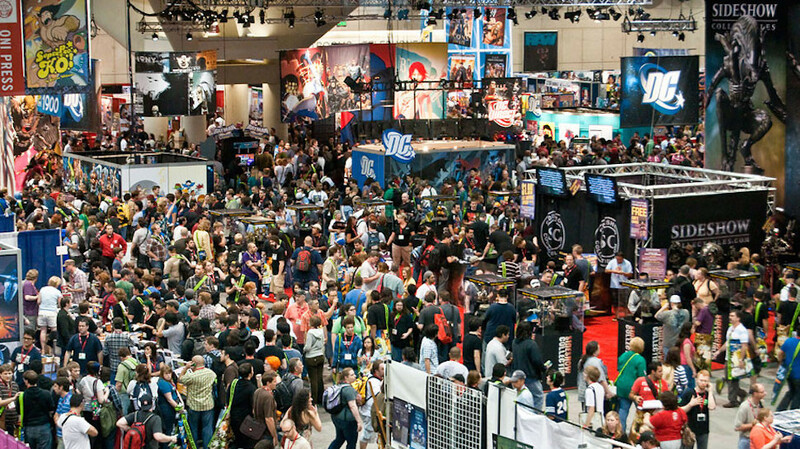 Mattel lost the golden chance to become the biggest among comic’s fan. Like has being made by Hasbro. Excuse me griping… but from here (Brazil) I can just lament all this. Hasbro used to have the license to DC’s figures and they foolishly sold it off. I’d bet that they would love to have it back and be able to produce both DC & Marvel product. 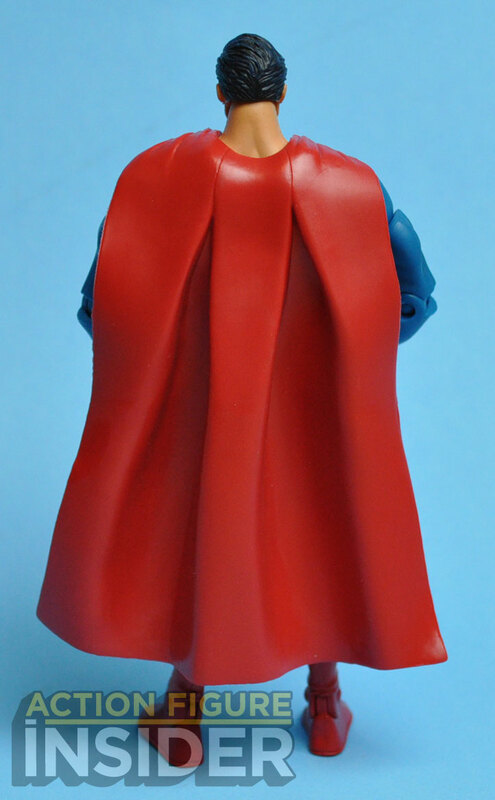 Miss Martian wasn’t in the Kenner Super Powers line. I wish they would just make additions to the original 80s line that are accurate to that particular style. This version looks over blown and just plain weird. 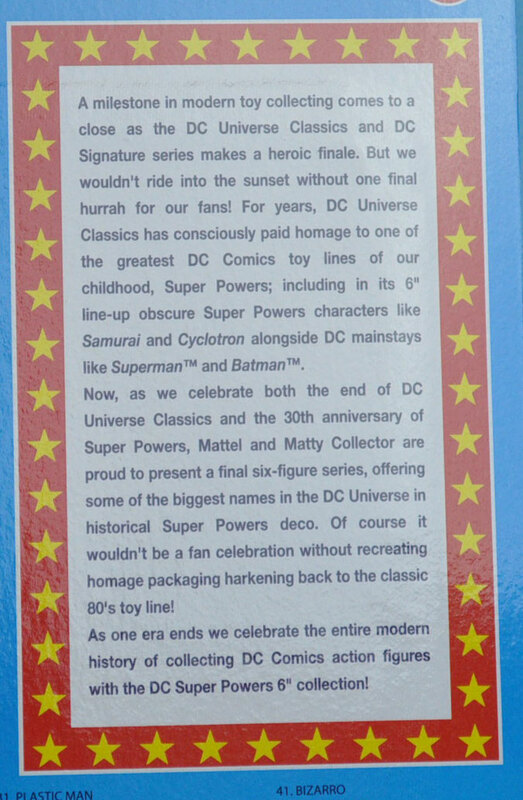 Mattel has never shown respect for the fans of DC. They just did whatever they wanted to. Their set up at the SDCC was a disgrace. I waited in line for over one-hour and thirty minutes to pick up a pre-ordered Batmobile. The hostility in-line from the fans was unbelievable. The scalpers ruled the whole process. 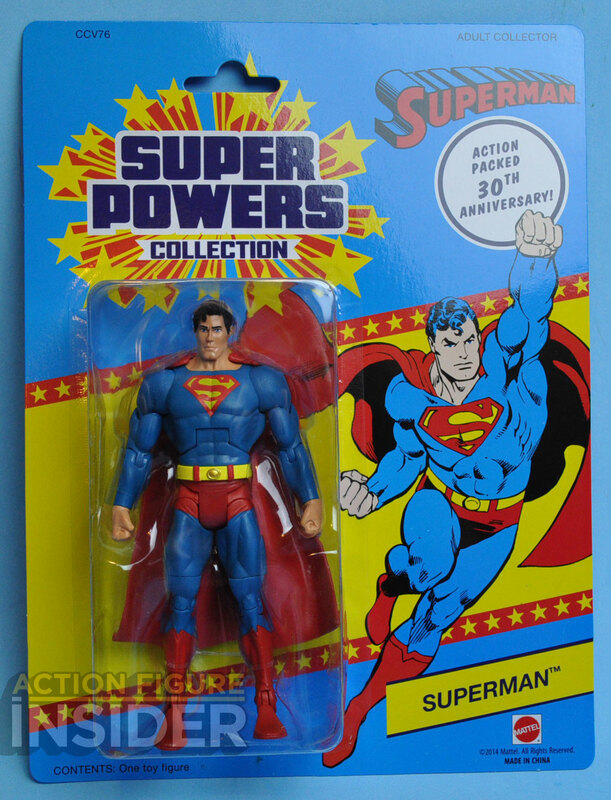 It is sad that DC renewed their license, but at least they are doing good work at DC Collectables. You stated that these are not replicas and I didn’t see a blast on the cards. 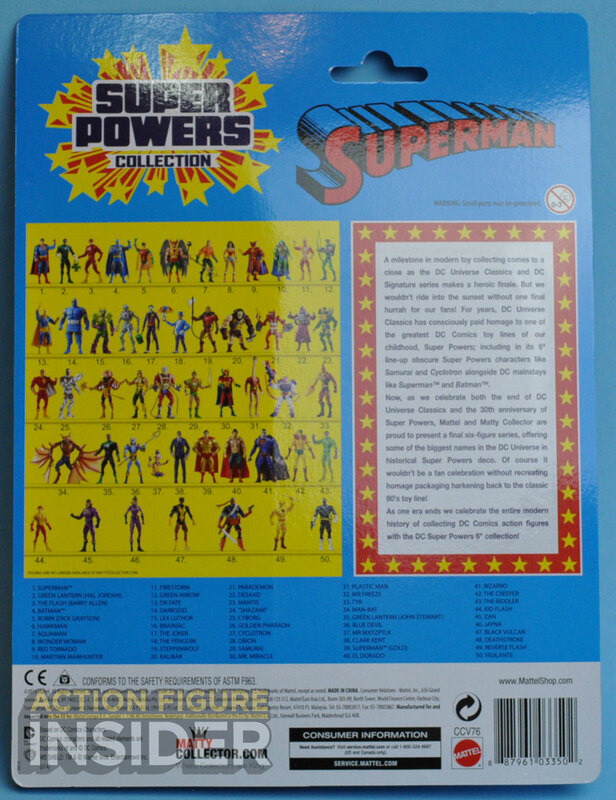 Will these figures have the Super Powers actions built into the figures like the Superman and Batman “punch”, or are they just static figures for display. And if so, why bother calling them Super Powers? No. There are no action features on these figures. 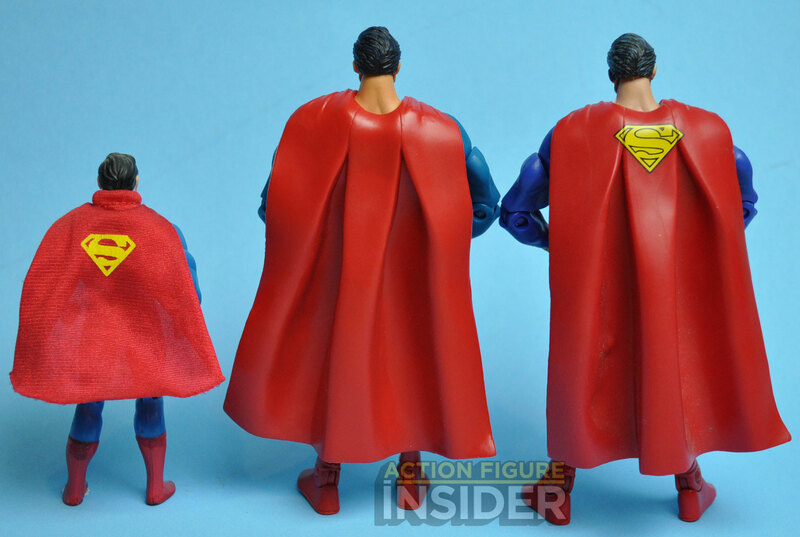 They are a tribute to the Super Powers line since Mattel did cover all 34 figures in the SP line in their 6″ DCUC line. I think they are an excellent tribute to the Super Powers line. Being in Australia I never knew I had the Australian packaged versions of the first 12 figures which differ from the overseas packaging. I still retain all of them and glad that the Kalibak BAF piece is not part of the blister card, but included in the white box. Wonder Woman is excellent as the others, but it may of been nice to have her lasso as a gold rope like the original; Superman’s “S” shield on the cape etc, but it’s a great tribute overall.